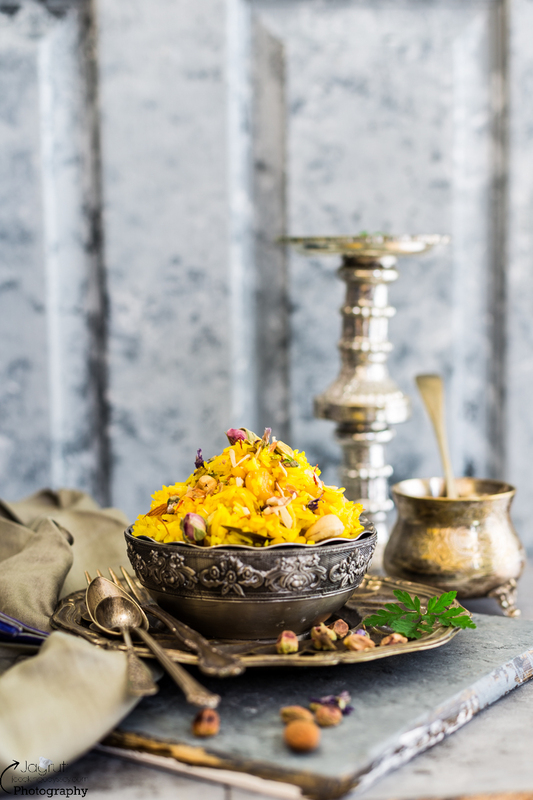 Biranj is a traditional Gujarati sweet dish, an absolute delicious and luxurious treat, it is so easy to prepare and you won't need many extra garnishing ingredients to make it look stunning ! It's gorgeous hue, with the sweet and divine aroma of this Biranj are enough to surrender yourself. It is an absolutely satisfying treat after any kind of spicy meal. 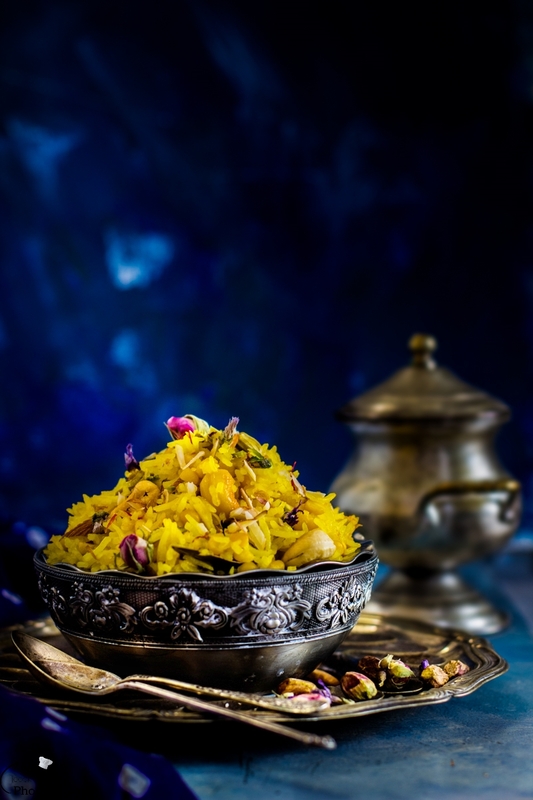 In the olden days traditionally this dish is prepared on special and happy occasions such as Hindu New Year ( Bestu Varas ) or Bhai Bhij, after Diwali. Biranj is made of rice, bengal gram ( chana daal ), sugar and aromatic spices, very close to Zarda ( Sweet Rice ) ! 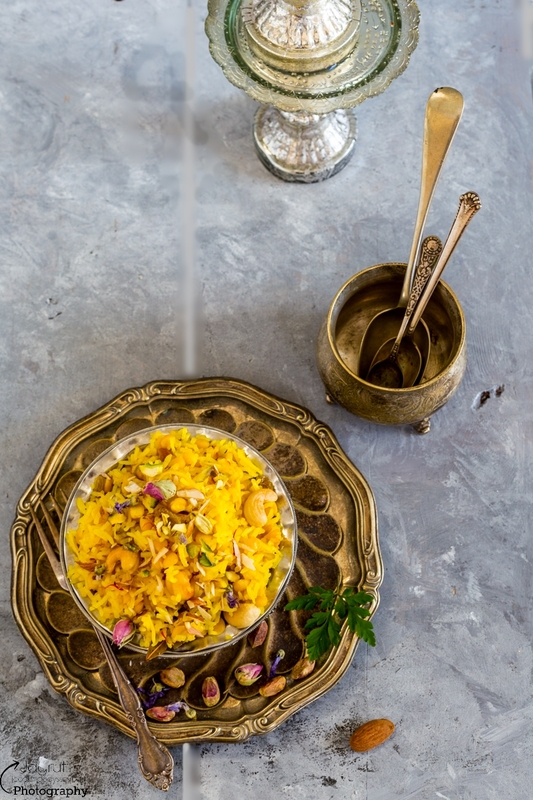 The best Biranj is one where each grain of rice is long, separated and firm without being mushy, all whilst being coated in aromatic golden sugar syrup and finished off with a confetti of rich nuts and raisins laced in each bite. This becomes a little party of flavours and textures in your mouth. Biranj is best served warm as a dessert after having spicy meal or served in a plate along with the meal. Wash and drain the rice and daal til water no longer runs cloudy. Once you can see clear water soak rice and daal separately for 40 minutes. Same time Soak saffron in the milk and leave it aside. In a heavy bottom pan heat ghee and add all the whole spices. When they starts to crackle add drained rice and daal and saute for 3-4 minutes. Then add 1/2 cup water and let the rice and daal cook. Once the rice and daal is about 70% done, at this stage you won't see any water in the pan. 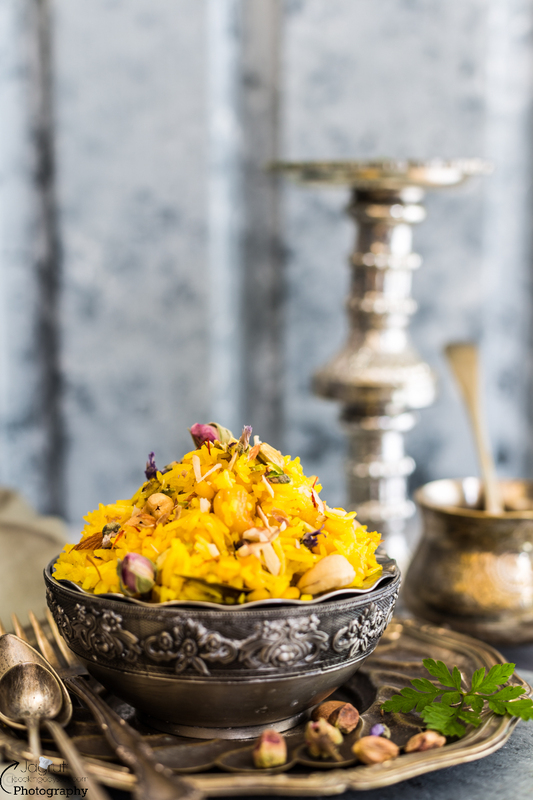 Add sugar and saffron milk, all the nuts and raisins and cover the pan with the lid and turn the heat to the lowest. Allow biranj to steam for 12-15 minutes. Once done ( rice and daal cooked and there will be no liquid remain in the pan ) carefully stir the mixture with the spoon. Careful not to break the rice. Let the Biranj rest for 5-7 minutes before serving. biranj for Gujaratis from Charotar usually means sev(vermicelli) cooked in milk till it becomes thick. Love your biranj, its so colourful and different.